The future of automotive brands: From car manufacturer to mobility provider? Bill Ford, CEO of Ford Motor Company, in November 2014. Digital innovations and changing consumption patterns are forcing car manufacturers to rethink their business models. In an industry that has seen little to no disruptive change over the last decades, automotive brands now face increasing competition by new players: tech giants like Google, new mobility providers, such as Uber, and speciality OEMs like Tesla (Gao et al., 2016). Car manufacturers have to transform into mobility providers in order to stay competitive. This entails an adjustment of their value proposition. They can no longer rely on the greatness of their products, but must also deliver an outstanding service that fits the needs of the future generation: Flexibility, preference for short-term commitments and an interconnected life (Bencsik, Horváth-Csikós & Juhász, 2016). Moreover, they will have to form strong alliances with technology companies in order to participate in the future of mobility (Beiker et al., 2016). But what are the implications for automotive brands? In an industry that is facing digital disruption, brands will be redefined. This blog post aims to review three major trends disrupting the automotive industry and give possible implications for the future of car manufacturers’ brands. Why do automotive brands need to adapt? Online platforms like Uber, Lyft and Zipcar exemplify a new trend: access-based consumption (Bardhi & Eckhardt, 2012), sometimes also referred to as sharing economy or collaborative consumption (Botsman, 2013; Botsman & Rogers, 2011). Access-based consumption describes an exchange in which consumers pay for temporarily accessing a product without being transferred the ownership (Lawson et al., 2016). The exchange, which is facilitated by an online platform, can take place between two peers (private persons) or between a business and a consumer (Schor, 2014). A recent study by PwC predicts revenues in the five biggest sectors of access-based consumption - namely travel, car sharing, finance, staffing, and music and video streaming - to grow from $15 billion in 2013 to $335 billion by 2025. This indicates that consumers increasingly engage in alternative forms of consumption (Lawson et al., 2016). Belk (2014) argues that access-based consumption has the power to disrupt established industries and destruct old business models. Instead of owning a car, more and more people opt to pay for the time they access it. Especially for young people, car ownership is increasingly viewed as a burden. They prefer flexible solutions and avoid long-term financial commitments (Bencsik, Horváth-Csikós & Juhász, 2016). This new shift in values from ownership to sharing along with Web 2.0 are two drivers of access based consumption (Botsman, 2013). Web 2.0 makes it possible for people to share content and connect online. It is the reason why people owning under-utilised assets can reach out to peers interested in using them. With ownership decreasing, the status symbol of the car is at stake. Since many car brands are built on the status that comes with owning their product, their brands could be in danger. According to Bardhi and Eckhardt (2012), who analysed the case of Zipcar, the consumer-product relationship in car sharing is low. Users of Zipcar did not feel any sense of ownership towards the car they rented. This raises the question, whether premium automotive brands like BMW and Mercedes will be able to retain their position in the market and will further on be perceived as “premium”. Ownership-based business models face destruction and car manufacturers need to adapt (Belk, 2014). New digital innovations will change consumer expectations. Wireless technologies will transform a car into a multimedia machine, which can be controlled from near and far (Francisco, 2013). Connectivity, infotainment and advanced driver assistance systems make software competence one of the factors determining future success (Beiker et al., 2016). Furthermore, the vision of autonomous driving is becoming concrete: McKinsey predicts that by 2030, 15 percent of all cars sold could be fully autonomous. However, most experts in the field of artificial intelligence do not work for car manufacturers, but tech giants, such as Apple and Google (Beiker et al., 2016). With Google & co gaining power in the car industry, automotive brands are in for a race. How can car manufacturers adapt and what are the implications for their brands? According to McKinsey, car manufacturers have a major advantage. They have been investing in plants, manufacturing processes and engineering for decades and chances are, they will be able to leverage on these strengths in the future (Beiker et al., 2016). But in order to remain the industry leaders and deliver complete mobility solutions, manufacturers would not only have to make significant investments towards technology development and innovation research, but also transfer their brands into a new context. Adapting to peer-to-peer sharing economy platforms such as Uber, some car manufacturers have introduced their own car sharing services. Examples include Daimler’s car2go and BMW’s DriveNow. Although car2go and DriveNow rely on Daimler’s and BMW’s cars, the services are operating under new brand names. Instead of choosing to extend their brands and offer a new value proposition under the same name, BMW and Daimler have chosen a different strategy. But why? In order for a brand to be successful over time, it needs to have strong values that remain stable during times of change. What can be adapted, is value proposition, communication and positioning (Urde, 2016). Traditional automotive brands are often associated with values like efficiency and reliability. In the case of BMW, it is driving pleasure; Mercedes symbolises the best or nothing. Although these values could be transferred to a mobility service, they might lack relevance in this context. Especially when it comes to car sharing, where users do not identify themselves with the car they are driving (Bardhi & Eckhardt, 2012). As of now, car manufacturers may be more successful operating as a mother brand and incorporating services as daughter brands, such as DriveNow and car2go. However, in the future circumstances might change: With less regard for ownership, the brand of the vehicle might be less important than the services connected to it. Therefore, new mobility service brands should offer a value proposition which is unique in several aspects in order to be competitive in the future. For a service to distinguish itself from competition only by offering a different car brand will not be unique enough, if the consumer does not feel any sense of ownership towards the vehicle. With competition from outside of the automotive industry threatening to enter the market, car manufacturers have started to form partnerships. Examples include Google, who works together with Fiat Chrysler Automobiles and Volvo, who joined forces with Uber earlier this year to work on autonomously driving vehicles (Kiley, 2016; Volvo Car Group, 2016). 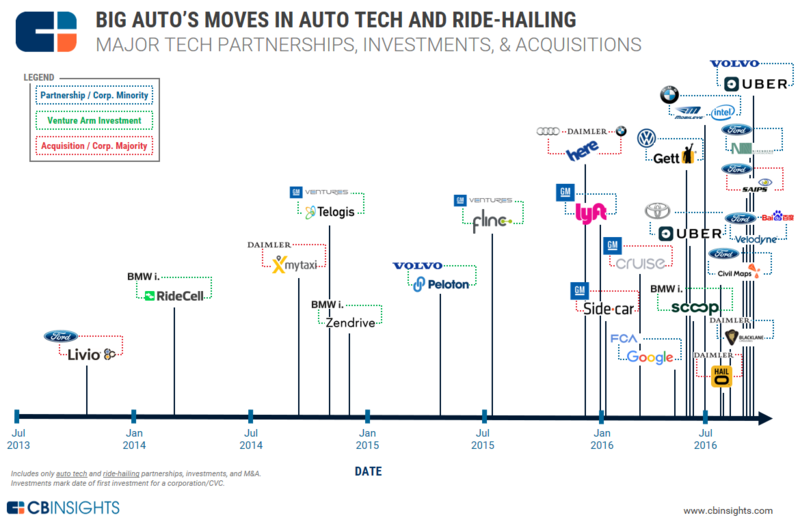 Strategic alliances make it possible for both, tech companies and car manufacturers to leverage on their strengths and develop new mobility solutions. Although brand alliances have several functional and emotional benefits, they carry potential risks (Uggla & Åsberg, 2010). When partnerships involve two brands with high brand awareness, one brand could potentially lose power to the partner brand. Hence, by forming alliances, automotive brands run risk of losing power to brands like Google and Uber. However, the task of developing mobility solutions requires an extensive amount of know-how from two industries and cooperation is necessary to be able to participate in the future of mobility. Presumably, car manufacturers will transform into hardware providers, integrating software solutions from tech companies (Beiker et al., 2016). Concluding, the future of automotive brands remains uncertain. Car sharing services are still in their infancy and expected to grow fast. Automotive brands will need to find ways to offer a unique value proposition in times where car ownership - and the status that so far has been connected to it - is decreasing. Furthermore, automotive brands need to cooperate with technology leaders in order to stay competitive. Hereby it is inevitable to watch the impact such alliances can have on the brand. One future scenario sees automotive brands transforming into hardware brands, whereas the software will operate under a technology brand, such as Google or Uber. The car industry faces a disruptive change and watching how automotive brands adapt to it will be exciting. Bardhi, F. & Eckhardt, G. M. (2012). Access-Based Consumption: The Case of Car Sharing, Journal of Consumer Research, [e-journal] vol. 39, no. 4, pp.881–898, Available Online: http://www.cass.city.ac.uk/__data/assets/pdf_file/0011/203789/Access-Based-Consumption.pdf. Beiker, S., Hansson, F., Suneson, A. & Uhl, M. (2016). How the Convergence of Automotive and Tech Will Create a New Ecosystem, Available Online: http://www.mckinsey.com/industries/automotive-and-assembly/our-insights/how-the-convergence-of-automotive-and-tech-will-create-a-new-ecosystem [Accessed 29 November 2016]. Belk, R. (2014). You Are What You Can Access: Sharing and Collaborative Consumption Online, Journal of Business Research, [e-journal] vol. 67, no. 8, pp.1595–1600, Available Online: http://www.sciencedirect.com/science/article/pii/S0148296313003366. Bencsik, A., Horváth-Csikós, G. & Juhász, T. (2016). Y and Z Generations at Workplaces, Journal of Competitiveness, [e-journal] vol. 8, no. 3, Available Online: http://www.cjournal.cz/files/227.pdf. Botsman, R. (2013). The Sharing Economy Lacks A Shared Definition, Available Online: http://www.fastcoexist.com/3022028/the-sharing-economy-lacks-a-shared-definition [Accessed 20 November 2016]. Botsman, R. & Rogers, R. (2011). Whats Mine Is Yours, How collaborative consumption is changing the way we live, London: Collins, [e-journal], Available Online: http://tantor-marketing-assets.s3.amazonaws.com/sellsheets/1920_MineIsYours.pdf. Ford, B. (2014). Bill Ford: Leap in Thinking Needed to Preserve Mobility Worldwide, Available Online: https://media.ford.com/content/fordmedia-mobile/fna/us/en/news/2014/11/19/bill-ford-leap-in-thinking-needed-to-preserve-mobility.html [Accessed 29 November 2016]. Francisco, C. (2013). Car Industry Must Remodel Itself to Exploit the Connected Future., Automotive Industries, [e-journal] vol. 193, no. 3, pp.1–3, Available through: http://ludwig.lub.lu.se/login?url=http://search.ebscohost.com/login.aspx?direct=true&db=bth&AN=89337309&site=eds-live&scope=site. Gao, P., Hensley, R. & Zielke, A. (2014). A Road Map to the Future for the Auto Industry., McKinsey Quarterly, Available Online: http://ludwig.lub.lu.se/login?url=http://search.ebscohost.com/login.aspx?direct=true&db=bth&AN=100038938&site=eds-live&scope=site [Accessed 26 November 2016]. Gao, P., Kaas, H.-W., Mohr, D. & Wee, D. (2016). Disruptive Trends That Will Transform the Auto Industry, Available Online: http://www.mckinsey.com/industries/high-tech/our-insights/disruptive-trends-that-will-transform-the-auto-industry [Accessed 29 November 2016]. Kiley, D. (2016). Why Fiat Chrysler Is The Perfect Partner For Google On Autonomous Cars, Available Online: http://www.forbes.com/sites/davidkiley5/2016/05/03/why-google-is-partnering-with-fca-on-autonomous-driving/#581447ad4f12 [Accessed 29 November 2016]. Lawson, S. J., Gleim, M. R., Perren, R. & Hwang, J. (2016). Freedom from Ownership: An Exploration of Access-Based Consumption, Journal of Business Research, [e-journal] vol. 69, no. 8, pp.2615–2623, Available Online: http://www.sciencedirect.com/science/article/pii/S0148296316301837. Schor, J. (2014). Debating the Sharing Economy., Great Transition Initiative, Available Online: http://www.greattransition.org/publication/debating-the-sharing-economy [Accessed 20 November 2016]. Uggla, H. & Åsberg, P. (2010). The Benefits and Risks of Strategic Brand Collaboration., IUP Journal of Brand Management, [e-journal] pp.35–48, Available through: http://ludwig.lub.lu.se/login?url=http://search.ebscohost.com/login.aspx?direct=true&db=bth&AN=78120131&site=eds-live&scope=site. United Nations. (2014). World Urbanization Prospects: The 2014 Revision, Highlights. Department of Economic and Social Affairs, Population Division, United Nations, [e-journal], Available Online: http://www.compassion.com/multimedia/world-urbanization-prospects.pdf. Urde, M. (2016). The Brand Core and Its Management over Time, Journal of Product & Brand Management, [e-journal] vol. 25, no. 1, pp.26–42, Available Online: http://dx.doi.org/10.1108/JPBM-05-2015-0875 [Accessed 29 November 2016]. Volvo Car Group. (2016). Volvo Cars and Uber Join Forces to Develop Autonomous Driving Cars, Available Online: https://www.media.volvocars.com/global/en-gb/media/pressreleases/194795/volvo-cars-and-uber-join-forces-to-develop-autonomous-driving-cars [Accessed 29 November 2016].